Beyond providing data for all 32 NFL teams, PFF also supports network broadcasters with game-preview packets that are used to enhance the in-game experience for fans and viewers. This Chiefs-Patriots preview features the same information our broadcast partners use for team research and in-game production. Tom Brady is having a hard time completing deep passes so far this season. Through five weeks, he’s attempted 22 deep passes (passes of 20-plus yards downfield), but completed just seven of those passes for 207 yards, three touchdowns, and two interceptions. He’ll look to get back into the swing of things against the Chiefs on Sunday night. 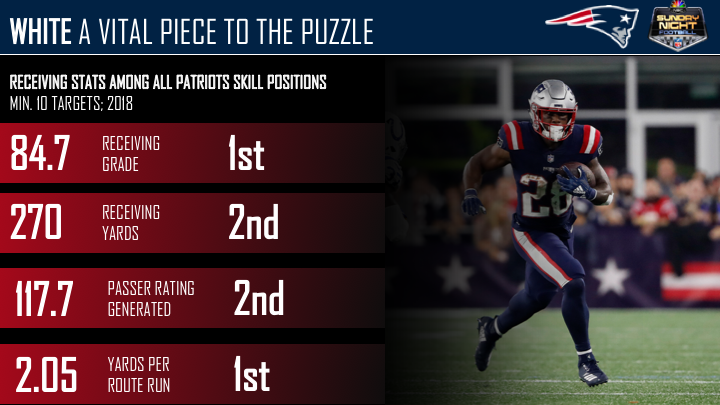 Running back James White was a vital part of the Patriots’ passing attack over the first five weeks of the season, and one wonders what this offense would have done without him. Fourth-year defensive end Trey Flowers is having a mightily impressive season so far, especially as a pass-rusher, where he’s already produced 14 total quarterback pressures from 78 pass-rushing snaps. He’ll look to slow down Patrick Mahomes and the rest of the Chiefs offense on Sunday night. 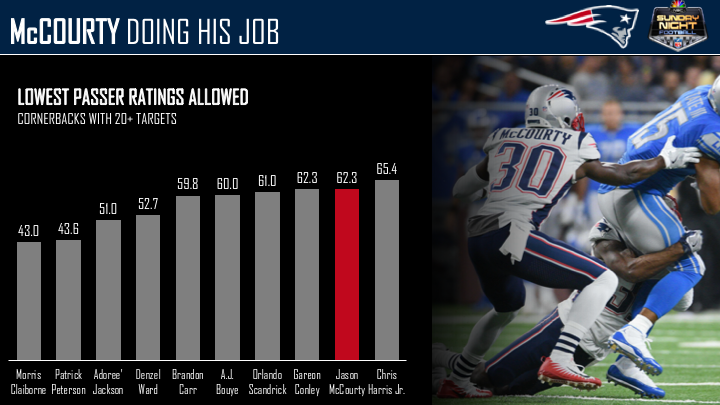 Jason McCourty has performed well in coverage so far this year, and he’ll look to continue that against the high-powered Chiefs offense. Through five weeks, McCourty has allowed 13 catches from 26 targets, for just 116 yards and he’s yet to give up a touchdown in coverage. All told, he’s allowed a passer rating of 62.3 on throws into his primary coverage – the ninth-best mark among cornerbacks with at least 20 targets. Second-year quarterback Patrick Mahomes has been nothing short of sensational so far this season. 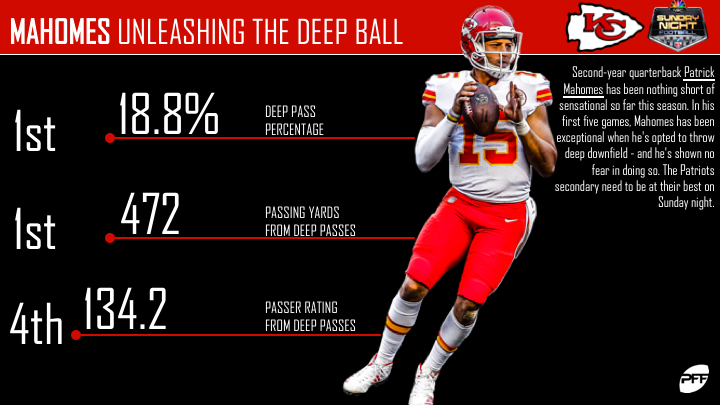 In his first five games, Mahomes has been exceptional when he’s opted to throw deep downfield – and he’s shown no fear in doing so. The Patriots secondary need to be at their best on Sunday night. Kareem Hunt enjoyed an incredible rookie season, in which he broke the record for the most missed tackles forced (77) by a rookie running back. This year, it’s been more of the same, as he’s already broken a total of 23 tackles on his rushing attempts – two more than the next closest back. 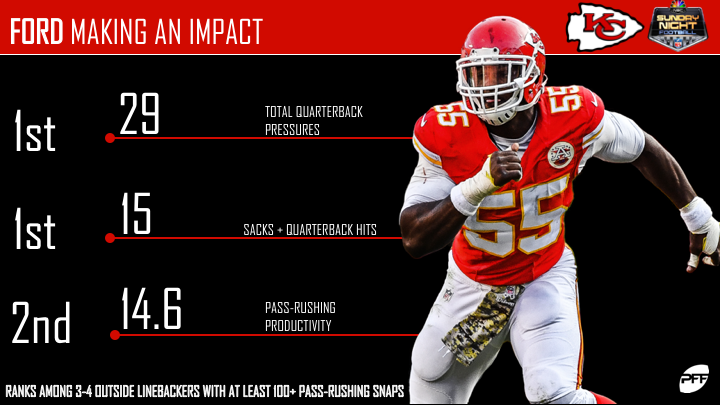 Former first-round pick Dee Ford has exploded out of the gate this season. Through five weeks, he’s produced 29 total pressures – the most among 3-4 outside linebackers. He’ll be looking to add to that total on Sunday night. Inside linebacker Reggie Ragland has been productive against the run so far this year. Through five weeks, he’s produced nine defensive stops on 78 run defense snaps and ranks 12th among players at the position with a run stop percentage of 11.5%. PFF Greenline has projections for the spread, moneyline and over/under of the Chiefs’ matchup with the Patriots. Get its picks here.